The titles published in this series were designed as handbooks for an intermediate-level agricultural education and training course. They may be purchased as a set or as individual documents. New titles will be added from time to time. The first twenty-six volumes in FAO's Better Farming Series were based on the Cours d'apprentissage agricole prepared in the Ivory Coast by the Institut africain de développement économique et social for use by extension workers. Later volumes, beginning with No. 27, have been prepared by FAO for use in agricultural development at the farm and family level. The approach has deliberately been a general one, the intention being to constitute basic prototype outlines to be modified or expanded in each area according to local conditions of agriculture. Many of the booklets deal with specific crops and techniques, while others are intended to give the farmer more general information which can help him to understand why he does what he does, so that he will be able to do it better. Adaptations of the series, or of individual volumes in it, have been published in Amharic, Arabic, Bengali, Creole, Hindi, Igala, Indonesian, Kiswahili, Malagasy, SiSwati and Turkish, an indication of the success and usefulness of this series. Requests for permission to issue this manual in other languages and to adapt it according to local climatic and ecological conditions are welcomed. They should be addressed to the Director, Publications Division, Food and Agriculture Organization of the United Nations, Via delle Terme di Caracalla, 00100 Rome, Italy. 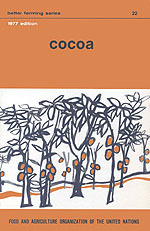 What varieties of cocoa can be grown in Africa?